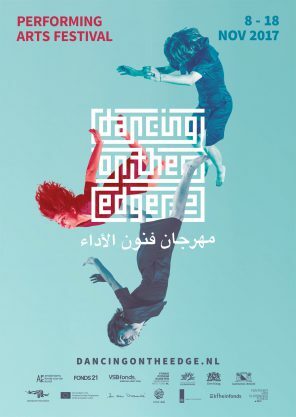 Cutting edge dance, theater and art installations showcased the artistic exchange between Europe, the Middle East and North Africa during Dancing on the Edge Festival 2017 in 4 Dutch cities from 8 till 18 November. Dancing on the Edge believes in the power of art as a laboratory to experiment, meet, and at times touch upon the more sensitive parts of our societies. Asking questions instead of looking for easy answers. Without ready-made solutions, but with an eye for complexity, multi-dimensionality, fluidity, and above all humanity. Therefore, the 2017 program had a strong focus on new work and (ongoing) artistic research. Times that ask for new theatrical languages and innovative festival formats: the 2017 edition saw Skype performances, a performance at sea (in winter! ), an international exchange between Dutch and Lebanese theater companies and a Meet the Artist lab.